Creating a business is exciting, scary, and time-consuming. A business launch is often years in the making so it can be easy to feel the pressure to succeed. Making a great first impression is detrimental to future service. If people see your brand as fun and exciting and they feel engaged at the launch, they are likely to tell their friends and family about your business which results in more customers for you. So, how can you make your launch unique? Before your launch, create social media accounts and begin interacting with your target audience. Find out what they like, who they are, and what they need help with. Using a hashtag is a great way to interact with people and can be used to track engagement and build hype. Not only does having a contest get people excited, it is a great way to promote your business. Creating a unique offer such as a giveaway or freebies at your launch gives people an incentive to get involved while simultaneously building your consumer base. More often than not, consumers will remember an experience more so than a product. Why not create a unique consumer experience at your business launch? A photo booth is a great way for consumers to have an amazing time while you advertise your business at the same time. With fun features like animated GIFs, custom digital props, and green screen backgrounds, a TapSnap photo booth will wow your guests and leave a lasting impression of you and your business. TapSnap recently attended the grand opening of Coast Performance Rehab in Vancouver and the event was nothing short of a success. Guests had a blast with the custom animated GIF and children loved adding digital props like cats and balloons to their photos. The customized GIF collage and sharing site carried over the company's branding seamlessly. You can get a behind-the-scenes look at the event by watching the video below! 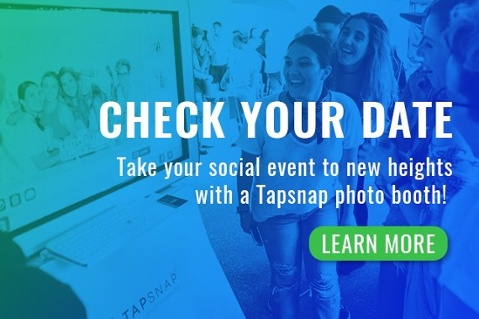 If you're interested in adding a TapSnap photo booth to your upcoming business launch or corporate event, you can learn more about our features here or check your date below!